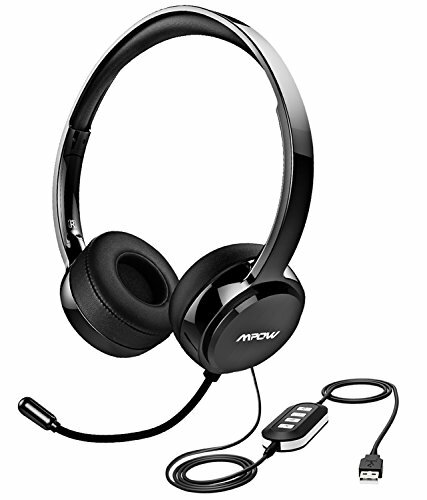 With the superior 40mm driver and skilled sound processing, Mpow USB headset is capable of delivering crisp, high-definition audio with clear, balanced tone while you are conversing on Skype. The headset is covered in soft protein memory ear pads to ensure comfort during extended talking sessions. Digital USB connection allows you to get plugged in quickly. The 7.9-foot (2.4-meter) cord gives you the flexibility to move around while you are talking. Thanks to the detachable cable, you may either connect the headset to your computer via the USB port/ 3.5mm audio cable or to your cellphone via the 3.5mm audio cable. Crystal Clear Chat Headset -- Built-in unidirectional microphone which can be twisted discretionarily picks-up your voice loud & clear. Reduces unwanted background noise for clear conversation. Great ideal for Dragon speak, Online courses, Skype chat, call center, conference calls, webinar presentations and more. 3.5mm Jack/USB Plug Connection Options -- The 3.5mm jack audio cable can be detached from the control box which gives you an additional connection option for Phones and Tablet. Or you can use the USB plug with control box to work with PC. Long headset's cord offers flexibility to move around. Noise Reduction Sound Card & Easy Access Control -- Convenient inline Volume Switch & Mic/Speaker Mute for easy access. A Built-in noise-reduction sound card of the control box lower noise output from devices. Provide outstanding audio on both transmit and receive. Extended Wear Comfort -- Headband and fluffy earpads pad with memory foam and wrapped by skin-friendly protein leather. Comfortably fit your head with the adjustable steel slider. Gentle Reminder: Depending on your head/ear size/shape, it may be a little tight for someone to wear which is designed to avoid sound leakage. In case of that and to get both audio and wearing comfort, please take off the headphone every 1-2 hrs to get your ears relax and protect them from muggy environment in use. Multi-Purpose & Wide Compatibility -- This headset can be used mainly for chatting, secondarily for music, and if needed, as a backup to a priority gamer headset(It is NOT specially designed for gaming ,please DON'T compare it with professional gaming headsets). Wide compatible with Windows 2000/7/8/10/XP/Vista, Mac OS X, iOS, Android, Tablet PC.